I wasn’t sure if I was going to make the trip to Humberside to watch one of the new teams in the Conference North. By some remarkably unfortunate luck, I had three Christmas Parties, that were all on consecutive days. The last one was a predictably messy affair in Prestatyn, which meant that the daft decision to be up at Guy’s Newsagents pickup in Colwyn Bay at 8:35am was drilled into me with a dreadful hangover and tiredness. I was umming and ahhing all week whether to make the trip to North Ferriby, there was a massive risk and reward. With the exception of Stockport County, I had hit Christmas and not seen any of the new teams in the Conference North. Whilst at Christmas Colwyn Bay were progressing well, three of the new teams in the league looked like they wouldn’t be in the Conference North in the 2014/15 season: Barrow are rock bottom, and North Ferthe riby along with Hendesford Town and Telford United are riding high in the league. With only Brackley and Leamington to go in the “Teams I’ve yet to visit in the Skrill North” List I have, I felt that I had to go, plus I could imagine it’s more expensive on the train than the tenner I spent on the coach. Nevertheless, it didn’t make the early start that much easier, plus I did feel like a lamb to the slaughter. 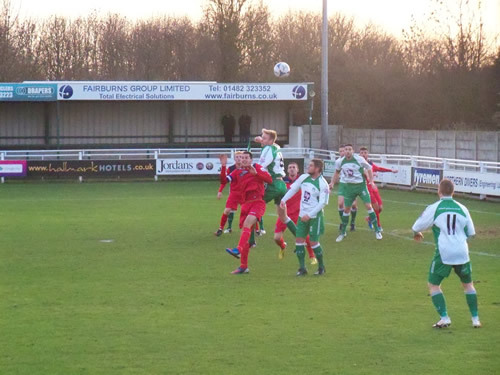 North Ferriby were unbeaten in 10 games at home, coming off the week before of a demolition of Woking in the FA Trophy. Bay on the other hand were unbeaten in 4, but the last game against Histon wasn’t exactly the world’s most convincing performance. Admittedly the pitch was dreadful, but it was more of a battling performance. Nevertheless, North Ferriby are currently riding high in the league, and the Seagulls were firmly in mid table mediocrity, this game had the Villagers as the firm favourites. In a rarity, I didn’t spend most of the pre-match build up in a local pub, but after one pint in The Duke of Cumberland (which produced a really nice session ale named after the football club), we headed through the lovely village to the ground, with comments usually relating to “How the heck can this place accomodate Luton, Wrexham & the like if they’re in the Premier?”. The clubhouse was nice though. A good selection of tapped ales, and the football on. The supporters were friendly too, stating that North Ferriby generally support two teams – them and Hull City, and the gates were expecting to be slightly up due to the Tigers playing away. All in all, it was pretty jovial build up. Another thing to point out is the food at North Ferriby was superb. A proper butcher pie with real steak pieces, and thick tasty gravy, with proper chips that tasted superb as well. All in all, we were well prepare for the not-unexpected loss. The game kicked off and North Ferriby started brightly, looking dangerous every time they approached the goal, with Bay hitting on the counter attack that has worked so well in the run up to this game. Although Ferriby had the earlier chances, Colwyn Bay took the lead on 24 minutes when a ball found Jamie Ellison in the right hand side of the box, and he shot into the opposite corner with very few defenders back. Bay extended their lead on the half-hour mark with Sean Williams producing an audacious chip to beat the keeper from 20 yards, in a fantastic goal. Bay got an early Christmas Present with a third from Jamie Ellison, when he broke the offside trap to score and should’ve got a first-half hat-trick, with a harder chance than the first goal was skied over the bar. In short the game should’ve been out of sight in the first half, but this is the Bay, isn’t it? 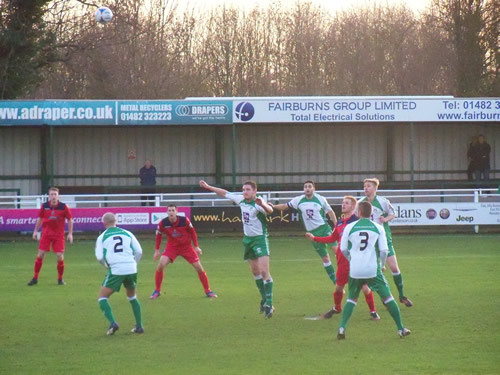 Yes, North Ferriby in the second half produced a lot more quality as they showed in the game at Llanelian Road, with probably the key decision was bringing on Anthony Wilson just before the half hour mark, and Bay’s nerves began to set in when – with half an hour to go – Russell Fry headed in from a right hand side corner at the far post. The game changed again with – on 65 minutes – Mike Lea got sent off for being the last man. It was on the edge of the box, with a free kick, which was blocked. However, Ferriby pulled within one goal with Nathan Jarman scoring an overhead kick to set up a nervy last few minutes, but with some great saves from Chris Sanna, Bay held on for 3 points. The result moved Bay into the dizzy heights of 10th in the Conference North, a fantastic result going into the Christmas period – Ferriby remain in the playoffs with results kind of going their way. All in all, a pretty good day out, and a great way to shift a hangover, with a football match in the shadow of the humber bridge.